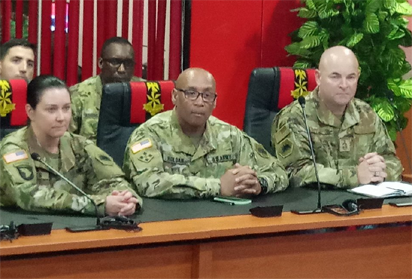 ABUJA – As part of efforts to curb the wave of insecurity in the country, the Federal Government has resolved to engage the California National Guards in the United States. Minister of Interior, Abdulrahman Dambazau, disclosed this Tuesday in Abuja when an American military led by Gen David Baldwin, paid him a courtesy visit. Dambazau revealed that the National Guard would also train the Agro Rangers Squad of the Nigeria Security and Civil Defence Corps NSCDC, adding that the National Guard will also train other agencies under the ministry in disaster management. “We want to seize this opportunity to express our gratitude on behalf of all the services under the ministry, for meeting with some of them and even offering to assist with some logistics to enhance their operations. “Part of what we want you to do particularly to the Civil Defence you met today is to create what we call Agro Rangers because of the incessant clashes we have between the farmers and herdsmen and the constant kidnapping we have in the country. We intend to provide adequate security that will help those that invested in agriculture to continue with their activities. We will want you to assist other agencies like the Fire services, Immigration and Prison in terms of training and logistics. “We, at the ministry, focus on policies that will enhance the internal security of the country and we want to seek your collaboration at that level you see how we can manage our efforts towards security sector reforms. “It is very important we reform our security sector to meet up with challenges of modern times. As you know, we have challenges of insurgency and terrorism which is a global issue. We should be able to collaborate with you on these issues. “Beyond that, I am sure that there are other things we can do together. National Guard is very important in the USA especially as it focuses on disaster management. We hope to leverage on the experiences you used in managing hurricane in the USA to manage disaster like the flooding we experienced this year in Nigeria,” he appealed. Earlier, the leader of the delegation, Baldwin, said: “We are very proud of the progressives you have made in the service of humanity. There has been a strong relationship between the ministry and the US National Guard. “We are here to explore other areas of partnership that will be of mutual benefit and to the people of Nigeria. We are interesting in the training of personnel especially those involved in the fight against insurgency and disaster management. “We are here to dialogue and explore opportunities we can work together particularly in the areas of ICT and disaster response. We look forward to working with you,” he said.